Irvine, Calif. – R.D. Olson broke ground today on its latest hotel development, the 271-room, full-service Irvine Spectrum Marriott at 7905 Gateway in Irvine, California. Executives from R.D. Olson Development, Irvine Company, Joseph Martelli Real Estate Investments, Inc., project general contractor R.D. Olson Construction, project architect WATG, and Marriott International joined civic leaders including Irvine Mayor Steven Choi at the ceremonial groundbreaking. Located next to the Courtyard by Marriott Irvine Spectrum, which opened in 2014 and was developed by R.D. 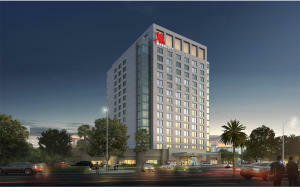 Olson in partnership with Joseph Martelli Real Estate Investments, Inc., Irvine Spectrum Marriott represents the first ground-up construction project in the nation featuring Marriott’s new Millennial-focused design elements. R.D. Olson Construction plans to complete construction in summer of 2017. As is customary for all R.D. Olson Development hotels, Irvine Spectrum Marriott is designed around a theme that pays tribute to the local area, in this case the iconic Irvine Ranch. The interior design celebrates the rich history of the Irvine Ranch through design elements, as well as food and beverage selections. The hotel’s full-service restaurant will feature locally-sourced options for breakfast, lunch and dinner. The 15-story, 206,332-square-foot hotel is designed with a room mix that includes 50 suites with full kitchens, 121 king beds, and 100 double queen bed configurations. The room mix caters equally well to weekday business guests and weekend leisure and group travelers. Guest rooms will offer views of Saddleback Mountain, Laguna Canyon or Spectrum Center. Guest rooms include technology features at the forefront of hotel design, including WiFi, big screen TVs with full connectivity and the ability to stream Netflix and Hulu without charge, convenience plugs, iPhone/iPod docking stations and more. The new Irvine Spectrum Marriott will offer a variety of event and pre-function spaces to accommodate the needs of guests, as well as local businesses. A large rooftop lounge, featuring a full-service bar, offers unobstructed views of the Irvine Spectrum. The hotel will also feature more than 13,000 square feet of meeting and pre-function space, including a large event lawn. Both the rooftop lounge and event lawn are well-suited for corporate events, parties and weddings. R.D. Olson Development began developing hotels in 1997 and has been especially active over the past five years, including the development of the Renaissance Clubsport, a full-service hotel in Aliso Viejo, California. Additional recent completions at Marriott brand hotels include Courtyard by Marriott hotels in Irvine, Oceanside and Goleta, California, and Maui, Hawaii; Residence Inn by Marriott in San Juan Capistrano, California; and Residence Inn by Marriott and Fairfield Inn & Suites hotels in Tustin, California. In December 2015, R.D. Olson Development received Marriott International’s most prestigious award, the Partnership Circle Award, to recognize the organization’s support of Marriott hotel brands and dedication to embodying the spirit of the company’s philosophy of providing outstanding customer service. In a co-development with Pacific Hospitality Group, R.D. Olson Development is scheduled to complete Paséa Hotel & Spa, a 250-room upscale boutique hotel in Huntington Beach, California, at the master-planned Pacific City project in 2016. In spring of 2016 R.D. Olson Development is scheduled to complete the 200-room Residence Inn by Marriott in Wailea, Maui, Hawaii, and the 144-room Residence Inn by Marriott in Old Town Pasadena, California. R.D. Olson Development recently broke ground on the 204-room Residence Inn by Marriott Silicon Valley in San Carlos, California. R.D. Olson Development and R.D. Olson Construction are planning to break ground on several other hospitality projects throughout California and Hawaii in Q1 2016, including the 130-room Lido House Hotel resort in Newport Beach, California, and the 118-room Residence Inn by Marriott Santa Barbara/Goleta in Goleta, California. In addition to R. D. Olson Construction’s work with R.D. Olson Development, the Irvine-based general contractor recently completed work on the full-service Bicycle Hotel & Casino in the heart Bell Gardens, California. The firm is currently under construction on additional regional hospitality projects including the 94-room Hampton Inn & Suites in Glendale, California; the 161-room Homewood Suites in Irvine, California; and the 174-room Country Inn & Suites by Carlson in Anaheim, California.